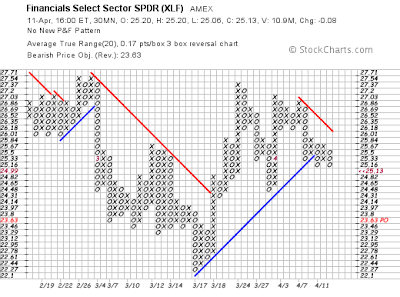 A bit late on this, but before Monday's open here is the weekly Stockcharts.com review. The sell off that I warned you about last Monday played out this week. A break down of the RSI occurred on the S&P 500 10-minute chart that day and we watched for prices to confirm the move with a break below the rising trendline. The RSI breaks down as the indicator falls below 33.33. The next morning prices gapped lower confirming the RSI. After a two-day decline a bullish falling wedge emerge in that same timeframe, which took prices back up to test gap resistance at 1370. Prices halted just three-points below the target at 1367. From there prices sifted lower producing lower lows (8th chart below). This occurred simultaneously with the breakdown of our rising wedge patterns on the indices. The breakout of the falling wedge pattern on the 10-minute chart coincided with the pull back to test the trendline of the broken rising wedge. This backtest provided another opportunity of traders to take a short position. Now I believe that the S&P 500 daily chart is backtesting its breakout of the recent declining trendline off the December highs. That trendline points to the 1320-23 area. I drew a speculative lower boundary for a channel in the 60-minute time frame, by drawing a parallel line mirroring the peaks made during our recent run. Using the March low as a refferance point I drew the parallel line, and it intersected with the trendline on the daily chart. They intersect at/near 1323. If that level of support did hold up it would mean that the S&P 500 would still have a higher low in place. The ADX broke to new lows below 20 this week as the positive direction line +DI moved below the negative directional line -DI. This is the forth crisscross that has occurred since the March lows. This occurs when markets are stuck in a trading range and trendless. 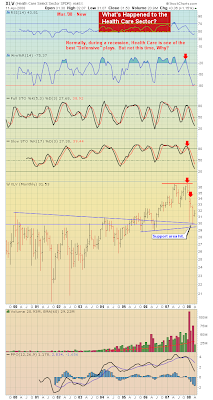 The S&P 500 is clearly moving in a lateral range as a possible double bottom is in play. If prices test the March lows again then a triple bottom could manifest. However, if they fail to test those lows then we could carve an inverse head and shoulders pattern. The pattern the emerges depends on how deep the retracements are of our current reaction. In contrast the Aroon, which another trend-based indicator continues to show strength, with the Aroon up line above the value of 70. While the Aroon down is behaving itself below 30. 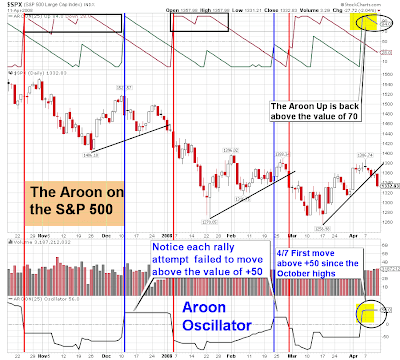 Additionally, the Aroon Oscillator, has broken above +50 for the first time since the October high. This is the first contra-trend that has managed to do that and this is the first time that a bearish cross didn't occur at the breaking of the contra-trends trendlline. This is a good sign, lets watch next week to see if the Aroon turns bearish. The Average True Range (ATR) is a indicator that measures volatility. It cannot be used to determine directional movement. But when a high value occurs on the ATR it produces an extreme peak on the indicator which is an indication that a strong move has already occurred and is likely to be unsustainable in the future. Such is the case with the ATR on the S&P 500's weekly chart. It is at the same extreme levels that occurred during late 2002 just before the bull market began (5th chart down), which is one of many bullish signs on the weekly S&P chart. However, the ATR on the S&P 500's daily chart is telling a different story. The ATR on the daily chart could be headed back up to test the two previous peaks made during the January and March price lows (1st chart down). The ATR reached extreme peaks while those lows were being carved out. With the ADX now signaling the absence of a trend and the MACD looking toppy again, it might serve us well to pay attention to the ATR. 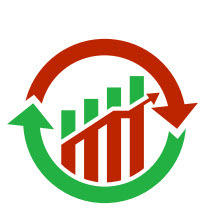 If it peaks at the previous extremes seen on the daily chart during the January and March lows, we may be able to determine as to what pattern is actually being constructed on the daily chart. Whether it be a double bottom, a triple bottom, an inverse H & S pattern, or even if prices break to new lows, the ATR will do its job by revealing areas in which could act as a reversal point. Study the first chart below and you can see that each time a prices bottomed or topped, the ATR was at either an extreme high or low point. This resulted in the ATR moving in the opposite direction at the place where the extreme occurred. So this current reaction might produce another ATR extreme. The Force index on the daily S&P 500 chart, had negative divergence on it both times during the last two contra-trends, which resulted in the the Force index moving below zero and the sealed the fate of the recovery. The breakdown during this contra-trend did not have negative divergence in place like the two times before. So I am wondering if the Force index will bounce off its rising trendline producing another point of positive divergence. This is speculation on my part, but I am watch the rising trendlines on both the Force index and the RSI to see if support holds. If it does both indicators will have multiple long-term points of positive divergnece on them, which is what ultimately changes trends. When the Force index is above zero the bulls are in control. When it falls below zero the bears are in power, and when it hovers near zero it signals that the market is trendless. 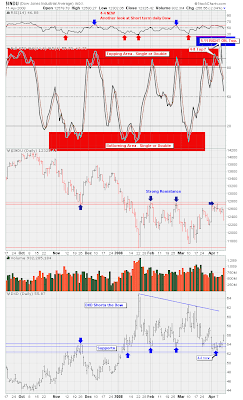 The technical conditions in the market are mixed right now, as oscillators tumbled over on the daily charts, while the weekly charts maintain bullish readings. Both the DJIA and the S&P 500 mangaged to see their MACD histograms move above zero closing the week in positive territory. This has not yet occurred on the Nasdaq. Accordingly, all three averages continue to have a rising slope producing higher bars. Both the DJIA and S&P 500 had a bullish cross of the MACD as the full stochastic line (14, 3, 3) line rose to just below the value of 50. Again the ATR is at extremes on all three of the averages. 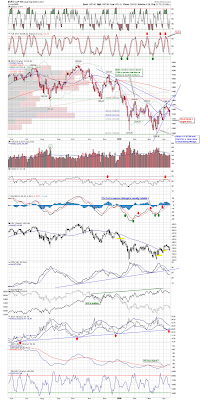 The downward trendlines on the oscillators was broke weeks ago. Lets see if buyers come back into the market once we have a backtest in play near the 1320-23 on the S&P 500. The indices must continue to pass a technical litmus test in order to validate any recovery attempt. Otherwise, the current attempt will fail and we will see lower prices. So far this recovery has held its own. 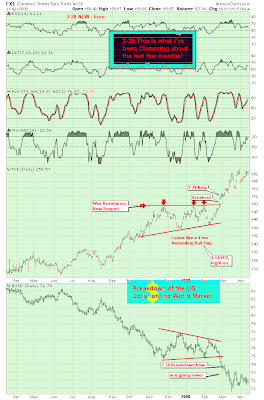 Study the 60-minute charts next week looking for oversold oscillators, as a possible new minor trend channel is born. Market breadth turned negative lastweek on the A-D line, as decliners out paced advances by a 7 to 2 ratio on the NYSE and by 4 to 1 on the Nasdaq. The VIX is bouncing off its 2007 trendline which is near the 200-day SMA. The VIX may test the 50-day SMA. But the VIX weekly chart has bearish signals.Next week we will get the PPI and CPI data for March on Tuesday and Wednesday. Come watch our video on the ATR at thechartpatterntrader.com. 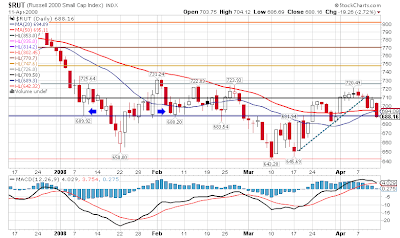 4/13 -- Added FXI- iShares China upon request. Also, note Alan Abelson's 'Snake Oil' column in Barrons about how this recession has a ways to go. 4/12 -- What we now know is that the uptrend from March 17th (the assumed 'A' wave correction) is now over and that the possibility of this being a slope change but remaining upward is also out. That puts us in the 'B' wave back down, which could retest the March 17th low, but probably will not go that far. Some of the minichannels downward have accelerated, so I cannot give any lines to serve as a lower target just yet. I did, however, put in some tentative down channels. 4/10 -- The morning bounce gave the illusion that something bullish was brewing, but after the fade I see still see this picture as more negative than positive. I was able to combine some of the recent zigzags on the 5-minute charts into larger minichannels that are all heading down. We've had a decent rally off the March lows now but the rally just looks like its losing steam. At the very least, it is now moving up at a lesser slope. 4/9 -- The breaks came today on a number of charts and all were to the downside. There is a possibility that the rising channels off the March lows are simply changing slope. 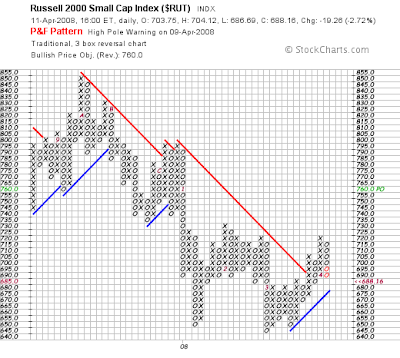 I drew those possibilities in green on the RUT and SPX hourly charts. Otherwise, we're in new declining short term trend channels. 4/8 -- Something's going to break soon. The Dow, RUT and SPX are all near their lower support lines on short term (hourly) charts. The Naz and QQQQ have rolled off upper lines already. Either there is another upward pop coming or we will see some breaks. It could start as early as tomorrow. As a final chart, I will show Richard's Gold chart. Note the backtest of former support - will it break (and if it declines, watch the dollar consolidation)?